It’s Monday and you know what Monday means… prizes! Oh no sorry, it doesn’t mean prizes. It’s points that mean prizes isn’t it? Let’s step quietly away from that one. Around here Monday means it’s Meet The Makers time! This week we have a great interview with Chelsea Slater of Liverpool Girl Geeks and InnovateHer for your listening and/or reading pleasure. 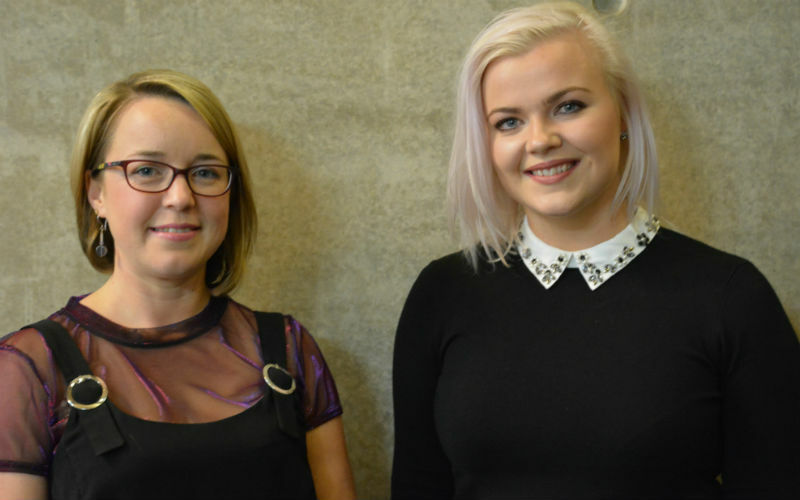 Jo Morfee (left) and Chelsea Slater (right) of Liverpool Girl Geeks and InnovateHer. Now some of you out there may ask what qualifies today’s guest as a Maker but I would argue that’s pretty obvious. Along with colleagues and allies Chelsea is part of making the most difficult thing of all, change! It’s a long road but in the 3 years since our first discussion great strides have been made. In this podcast we discuss some of the amazing projects already under way and some plans for the future. What follows is a much shortened transcript of our interview. If you want to hear the full thing you can GRAB THE PODCAST and subscribe to make sure you get all the latest episodes as soon as they’re published. DAN: Today I’ve travelled to the home of Liverpool Girl Geeks to meet Chelsea Slater. How are you doing? CHELSEA: Good thanks, it’s nice and sunny. CHELSEA: That just doesn’t feel 3 years ago does it? DAN: No, it’s a long time and it’s fair to say you’ve been pretty busy since then. I know not everyone will have heard the first interview so can you tell us what Liverpool Girl Geeks is and what you do? CHELSEA: So, back then I wasn’t doing it full time and it was only just starting. Liverpool Girl Geeks aims to inspire women to have careers in technology and we do that through a series of courses, workshops and events. DAN: It’s grown massively hasn’t it? I mean here we are in your office, you’re doing it full time and you’ve got a couple of employees as well. It must be amazing. CHELSEA: It is amazing and I think back then I realised I had to leave my job because the demand was so high for what we were doing. We had so much support within the city when we first started. I just decided to quit my job, do this full time, create more of an impact, build some programmes and then I met my business partner Jo. She was working at Liverpool Vision in a really good job and she said “I wanna quit my job too and join you” crazy woman. It enabled us to do so much in the last couple years and we’ve been in our office just over a year now. A year in April. DAN: Did you have a first anniversary party then? CHELSEA: No, we’ve been too busy but we do need to do that. We had some drinks to celebrate when the sun appeared for a bit but we still need to have a proper party. DAN: I’ve been talking to a few different people who do similar projects and one of the big problems everyone has is getting funding. You’ve done brilliantly at that so do you have any secrets or tips you can share? CHELSEA: We have had some success but it’s still really challenging. We’ve gone down the corporate funding route rather than public grant funding. We have had some public funding as well but we feel having those corporate relationships has enabled us to grow a bit quicker. Also going that route means it’s so much more flexible in what we can deliver. So that’s how we run our business really, through those funders but also through a few grants as well. Liverpool Girl Geeks also run our own courses so we charge for those for individuals, we also have a membership scheme for companies in the local area who can sign up to financially support us and we work with them. So the advice I’d give is don’t rely on any one type of funding. Don’t only look for grants because if you don’t get a grant then you won’t have a business. Try and look for a different array of funders and then your own products you can sell as well. So we have the courses as a product and we sell them as a service. DAN: So the work you’ve done with partners was something l wanted to talk about. That seems to be going really well, you’ve got a growing membership and it’s been going a couple of years now? CHELSEA: It’s in it’s second year. When Jo came on board this was the first project that we did together. We thought one how can we sustain the business and create a service for partners rather then them just funding something we do. Second, how can work with smaller companies around the city on their diversity policies and recruitment practices, so we put that together and formed the membership. We’ve got 10 companies so far and we’ve just signed another one today which is amazing. We’re not looking for a massive membership, we want companies that really truly care about diversity on board and we give them marketing and recruitment services for that. So that means we’ve been able to grow with them and we’re doing some really good stuff together. They’ve all signed up to a pledge this year which means they’re going to work towards having more women on their boards, and not even just more women but more diversity in general which isn’t just about gender. Then also having more diverse recruitment panels and making sure that’s fair, looking at flexible working and other ideas so it caters for a more diverse team. DAN: So tell us about InnovateHer what’s that and how does it fit in? CHELSEA: So InnovateHer was developed by me and Jo last year because we were doing a lot of work with young people within Liverpool Girl Geeks. We had a programme called The Girl Geek Academy and that was for 11 to 17 year old girls. 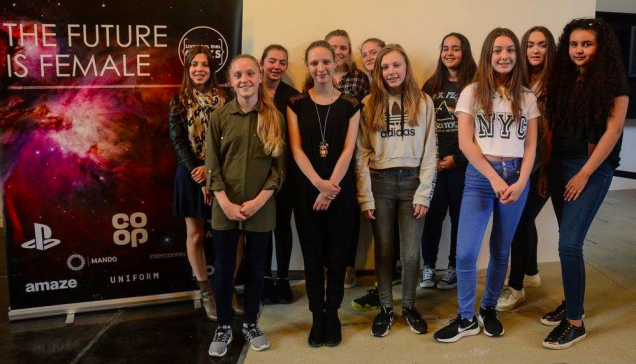 We had real success with that, it was an 8 week programme that looked at things like game design, wearable tech, music tech, tech for good and we realised that wanted to showcase this not just in Liverpool but work with girls across the UK. So we knew that we had to have a new brand for that because the problem with Liverpool Girl Geeks is the name doesn’t work once you take it outside Liverpool. Some of the girls attending Liverpool Girl Geek Academy. CHELSEA: Yeah! Well we picked a load of names and a lot of them were really quite young and we didn’t think they’d go for InnovateHer but they picked that one. So now we’re taking InnovateHer nationwide into schools and we’re delivering it there to make a bigger impact. DAN: Wow, doing it nationwide must be a real challenge. CHELSEA: It’s scary, and we’re not there yet. So we’re focussing on the North West first. We’ve got some schools in Liverpool, Wigan and Manchester signed up but then we want to take it into other areas. DAN: I’m not seeing the full spectrum of what happens in schools obviously but one of things I have noticed is at events like Liverpool MakeFest we’re seeing a much more even split between boys and girls in the really young kids. So do you think in 20 years time it’ll look a lot better? CHELSEA: We really really hope so, that why we started this. We hope that in 10 years time we won’t have a business any more because their won’t be a problem, we’ll have to think of something else to do but we still find so many teachers and so many parents saying that girls can’t do engineering, technology or computer science. That’s so frustrating and we just don’t realise. So these kids are growing up with technology, they can use technology but they’re not being told “you can have a job working with technology”. So they’re the barriers we’re trying to tackle and unfortunately we see quite a lot of it. You get families at MakeFest, you get boys and girls, that’s why it’s important for us to exhibit at these events so we can get into them early and say “this is an amazing sector to be in”. DAN: So you mentioned the plan is to almost be obsolete in the future when this problem is fixed but what are your future goals? CHELSEA: Yeah that is our hope, that there won’t be this problem. I can’t see that happening in the next 10 years, I really hope something does dramatically change but with the current education system there’s bigger things we need to change to get there. InnovateHer is definitely something that we’re really ambitious about, we want to take it all over the UK, so that’ll be in the next 10 years. Afterwards who knows? You just don’t know but that’s the exciting thing about technology, anything could happen. DAN: Has it surprised you how much this has taken off? In the space of 3 years you’ve done so much, has that been a surprise? CHELSEA: Yeah, back then I didn’t think it would be a business, I didn’t think I’d be able to make a career out of it. Just seeing the girls and what they’ve gone on to do is what drives us. It is challenging all the time, owning a social company isn’t easy but seeing the results is just ace and we can’t wait to see what happens next. DAN: So we should talk about Liverpool MakeFest, that’s a large part of why I’m here. So what are your impressions of the event? CHELSEA: It’s amazing isn’t it? I just love that it’s free, that you get loads of families and you can do a workshop upstairs, you can go and see the view from the roof, you can go and meet all the amazing people who work in the Maker sector, creative and tech sectors in Liverpool. But also meet people nationally because you have people travelling from all over now. I think the big thing for me is you just see so many people being inspired that day and you also leave feeling inspired. DAN: You’re going to be there this year again with InnovateHer so what are you gonna be doing? CHELSEA: I think we’re going to have some teens who’ve graduated from our courses working on the stand. So I’m gonna be there but it’s all about them. They’re gonna hold the fort and talk to people about what InnovateHer is all about. We’re also gonna do some kind of activity on the stand as well. We’ve just developed a make your own Snapchat filter” activity so we might do that, or perhaps we’ll come up with something else. Not sure yet. DAN: Do you know where you’re going to be? CHELSEA: We’re in the Discover Room. DAN: Excellent, so that’s the big dome shaped room on the right as you come through the main entrance. Thanks for talking to us today and we look forward to seeing you at MakeFest on June 30th. CHELSEA: Thanks you very much, see you there! So there you have it, what a great interview. A big thank you to Chelsea for giving up some time to tell me all the cool things that are going on with Liverpool Girl Geeks and InnovateHer. They just seem to go from strength to strength and that’s a testament to all the people involved. Find out more about them via the websites, just click on the names above. Don’t forget you can listen to the full audio of this and subscribe to the podcast if you like. Why not get your tickets booked if you haven’t already? Do it now. You can also volunteer to help out on the day and we really do appreciate that. It’s not a strenuous job but just some help moving tables or directing people to the right places makes so much difference. If you’re up for that there’s a form you can fill out on the volunteer page. We’ll be back next week talking to another of our wonderful Makers. In the meantime have a great week and keep making things happen.